A fundamental idea of Scientology is that increased awareness is the only factor which offers any road to increased survival and happiness. Through auditing one becomes free. This freedom must be augmented by knowledge of how to stay free. 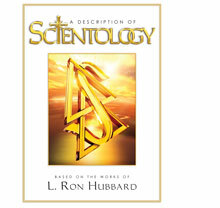 Scientology contains the anatomy of the reactive mind in its axioms and the discipline and know-how necessary to handle and control the laws of life. The practice of Scientology, then, is composed in equal parts of auditing and training in Scientology principles which includes the technology of their application. Knowing the mechanisms by which spiritual freedom can be lost is itself a freedom and places one outside their influence. Auditing lets one see how something happened, training teaches one why. Students seated at tables study the written works of L. Ron Hubbard, dictionaries at hand. Some, wearing headphones, listen to his lectures, while others drill the principles of application – all in the precise sequence as laid out by their materials. There are no teachers present. Instead, an ambulatory Course Supervisor moves from student to student, monitoring their progress, while a Course Administrator provides any needed materials. Here one sees enthusiastic students, not only assimilating data, but actually learning how to apply it. This is Scientology training and it is unique in the field of learning. Training is the way to learn the technology of Scientology. Technology implies use. There is a gap between knowledge and the application of that knowledge. By becoming trained, a person becomes able to use the truths found in Scientology to accomplish the purpose of improving conditions in life. Because Scientology is an applied religious philosophy, the study of Scientology emphasizes application. What exactly does one do to reunite a father and a son, to ease the suffering of a widow or repair a failing marriage? Other practices espouse how one must maintain faith, work out differences or endure with dignity. But does such advice, however well meaning, actually make a difference? When a student enrolls on a Scientology course aimed at providing him the means to better any relationship, he will actually acquire an understanding of the subject, and equally important, the skill to apply it. By way of an example, let us suppose that a Scientologist is faced with the prospect of a friend’s impending divorce. A trained Scientologist has learned why a marriage – any marriage – fails. He understands why good communication ceases between partners and how affinity becomes lowered. Knowing this, he can do something effective to salvage a marriage. He knows methods of reestablishing communication between estranged husbands and bitter wives, and how to rekindle love all but extinguished by marital transgressions. Training in Scientology gives him what nothing else can: a truly workable means of dealing with real-life situations. Someone who has only been audited as a preclear might understand part of a problem in his own marriage but he will not have a complete understanding of it, much less the skills necessary to help others understand theirs. Any person’s involvement with Scientology therefore invariably includes gaining knowledge through education in Scientology principles. By learning the subject, one comes to own the knowledge of Scientology for himself and so is able to improve his own life and the lives of others.